@OCC: Landscapes in Oils - 2-Day Workshop w/ Carole Boggemann-Peirson | Oxford Maryland Vacations! Carole’s workshop from 9am-3pm is designed for students who would love to improve their skills. Carole will cover aspects of strong paintings such as composition, values, color, light and texture to help lift students’ work to a new level. Rather than necessarily working toward leaving with a masterpiece, each will effectively study and practice painting a solid piece from start to finish. Carole’s workshop costs $195 and includes all supplies. Carole Boggemann-Peirson is a Dutch artist who has been giving demonstrations, teaching work-shops & private lessons on and off the Eastern Shore of Virginia since 2005. 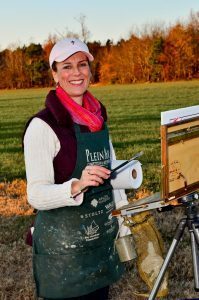 She was juried into Plein Air Easton (2013) and has won awards at Local Color (Easton), Paint Snow Hill, MD, Solomons Plein Air Festival (2014), Gloucester Plein Air Festival (2017) & many more. Her work is in international col-lections and she was the featured and event poster artist for Fine Arts@Oxford show in 2015. Cost: $195 for both sessions workshop includes all supplies. Bring your own if you prefer.